Yes, upgrade me to stainless. Yes, add a Thermo kit. It's a charcoal grill and a smoker. PKs unique capsule shape and 4 vents make it easy to grill hot and fast or low and slow. Aluminum is rust-proof, durable, lightweight and conducts heat 4x more efficiently than steel charcoal grills. The Original PK Grill & Smoker detaches easily from any of it's available stand options for transport. As a portable smoker grill, PK's are great for tailgating, camping, fishing/hunting cabins, etc. The 4-Point Venting System™ on The Original PK combined with its unique shape is ideal for both direct and indirect cooking, known as 2-Zone Cooking. The 4-point system provides exceptional air flow inside the grill capsule. Keeping consistent heat on a charcoal grill has never been easier. on purchase of $99+. Check out with PayPal and choose PayPal Credit. Thanksgiving Turkey, burgers for the baseball team, pork butts, brisket, ribs, chicken, whole fish, whole meal, this grill is Built To Cook. Cooking Surface Area: 310 sq. in. Overall Dimensions (Closed Lid): H - 34.75" W - 36.375" D - 19.5"
Shelf Surface Area: 544.5 sq. in. Cooking Surface Area: 360 sq. in. Overall Dimensions (Closed Lid): H - 42.9" W - 54.2" D - 23.6"
Shelf Surface Area: 618 sq. in. 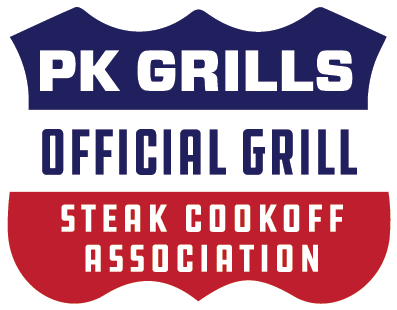 We stand behind the PK Grill & Smoker completely. If you are not entirely satisfied with your new PK Grill & Smoker, we want to know about it. Contact us immediately to resolve the issue at customerservice@pkgrills.com or 1 (866) 354-7575. This item is covered by PK's 30 Day Rust Free is Risk Free Satisfaction Guarantee. If you are not completely satisfied with the PK 360 Grill & Smoker, return it to us for any reason. Portable Kitchens, Inc. further warrants the cast aluminum grill capsule against burn-out, rust or breakage for a period of ten (10) years from the date of purchase under normal, non-commercial use. This warranty is between the purchaser and Portable Kitchens, Inc. Should any of the above conditions occur, Portable Kitchens, Inc. will repair or replace parts affected free of charge to the purchaser provided a warranty card or online registration is on file with Portable Kitchens, Inc. All postage or freight to the factory will be the responsibility of the purchaser.